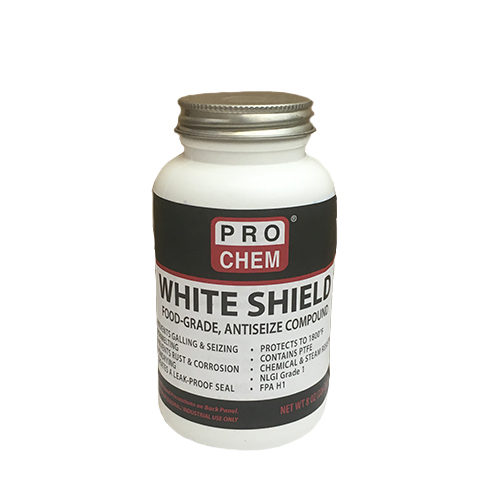 WHITE SHIELD | Pro Chem, Inc.
WHITE SHIELD is a premium, synthetic, food-grade thread sealant and antiseize compound that is engineered specifically for the food processing and packaging industry. It is acceptable for use as a lubricant with incidental food contact and meets the requirements for Kosher certification. This product provides a superior leak-proof seal for the life of the connection while maintaining its antiseize capabilities. This allows for easy disassembly without thread damage. It is safe to be used on all brass, black iron, galvanized steel, stainless steel, aluminum, copper, PVC and fiberglass reinforced pipes. It does not contain any solvents, lead, graphite or clay fillers. Apply to threaded fitting before attaching. Do not allow to enter drains (may clog drain). *Caution: Not recommended for oxygen service.